Maine has no shortage of delicious pizza places across the state. Next time you’ve got a craving for it, feast on gourmet pies sprinkled with all your favorite toppings. Tasty pizza is sold everywhere from bakeries, to bars, to high-end restaurants, so you have a lot of options to find the best pie in the state, but here are our favorites! With multiple locations across Portland, South Portland, and Yarmouth, OTTO is a local favorite. Ranked as one of the best pizzerias in the country, OTTO is no stranger to winning awards for their creative pizzas. Don’t miss their famous mashed potato, bacon & scallion pizza! If you’re not a fan of thin-crust pizza then you will love the thick crust Sicilian-style pizza from Slab. With an extensive menu of pizza and beers on tap, Slab will quickly become your favorite place for pizza in Portland. Plus, you can’t beat their one pound slice for $6! Voted as the “Best Pizza in Downeast Maine” by the Bangor Daily News, Finelli has been serving up authentic New York style thin crust pizza since 2001. The pizza dough is made in-house daily so you know you’re only getting the freshest pie. Profenno’s Pizzeria & Pub has been a staple of downtown Westbrook since 1962. This local favorite serves up traditional pub fare, seafood, and pizza. The dough is made from scratch daily and the ingredients are fresh. Sit it or dine out. It’s your choice. George’s Pizza has been serving award winning pizza since 1976 in downtown Auburn. 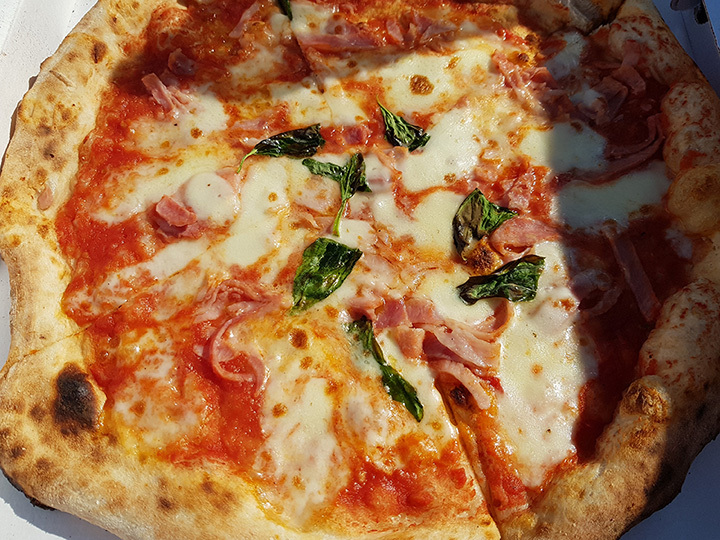 Their pizza dough is made in-house using their secret recipe and only the highest quality ingredients. With great prices and tasty pizza, George’s Pizza will quickly become one of your favorite pizza stops. Pat’s Pizza is one of Maine’s oldest pizza restaurants. Opened as Farnsworth’s Café in Orono in July 1931, pizza was added to the menu in 1953 where it became an instant success. The name changed and now there are multiple locations across the state. All locations offer a friendly, causal and affordable dining room for the whole family. Portland Pie Company is a favorite amongst the Greater Portland community. After their success in the heart of Portland, Portland Pie Company now has locations in Portland, Biddeford, Westbrook, Scarborough, and Brunswick. You can even purchase their specialty pizza dough at the local supermarkets. Their classic Old Port pizza is to die for! Pizza By Alex has been serving personal sized Greek-style pizza to the Biddeford community since 1960. This Biddeford staple is known to serve over 1,000 of their famous 10-inch pizzas on busy days. You can’t beat the prices. Just remember to bring cash. Reno’s Family Restaurant is a classic Caribou establishment operating since 1965. Reno’s is Caribou’s premier pizza specialty restaurant with everything from personal 10-inch “flyer” pizza to family-sized 16-inch pizza. Enjoy a simple cheese pizza or create your own with their large selection of toppings. Owners, Marty and Donna, grew up in Pennsylvania where they enjoyed authentic New York-style pizza made by Italian immigrants. After working at one of the local pizza shops, they moved to Bangor where they opened Jason’s NY Style Pizza. Serving everything from pizza to calzones to pasta, you’ll find great food at Jason’s!